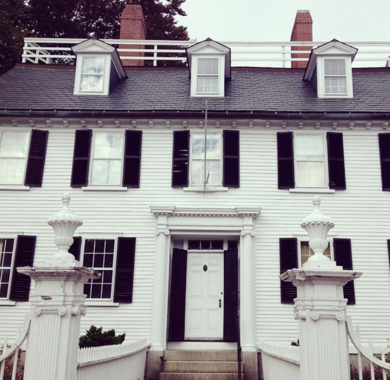 If you’ve never been to Salem, Massachusetts, especially during the month of October, it’s quite an experience. 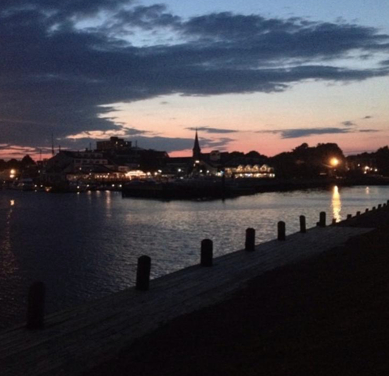 Known as “Haunted Happenings”, thousands of people flock to this waterfront town to learn about its history of witchcraft while celebrating Halloween. With the leaves changing color, crisp cool air, and pumpkins galore, Salem embraces its spooky past and makes the most of the fall season. The culmination of this month long celebration is of course October 31st, when the streets are filled with people in costume, radio DJ’s, dance parties, and fireworks. It’s the most popular time to visit Sale. They make the most of Halloween and have an absolute blast doing so! Salem in the fall season can be thrilling and lots of fun, but very busy. If you can make a trip in the spring or summer, or even brave the cold and go in winter, you may have less crowds and more flexibility. Whatever time of year you do visit Salem, there are plenty of gluten-free options in store for you! Salem’s gluten-free food scene is packed with possibilities. It’s got the best gluten-free bakery, an eclectic pizzeria, wine and cheese shops, a funky ice cream parlor, and an amazing local cidery. Salem’s culinary world is filled with delicious treats and goodies just calling your name. Salem’s downtown area is easily accessible by car or train. The Boston commuter rail goes directly to Salem and once you exit the commuter rail station on Bridge Street (Route 107), you are right at the start of downtown. If you plan to drive, try the public parking lot located behind the Peabody Essex Museum between Church Street & Federal Street. Prices are very reasonable and it’s free after 6 p.m. The one place anyone visiting Salem on a gluten-free diet absolutely must go to for breakfast, is not actually in Salem, but the next town over. Heading north across Route 107 another 2.2 miles is Crave Café and Bakery in Beverly. 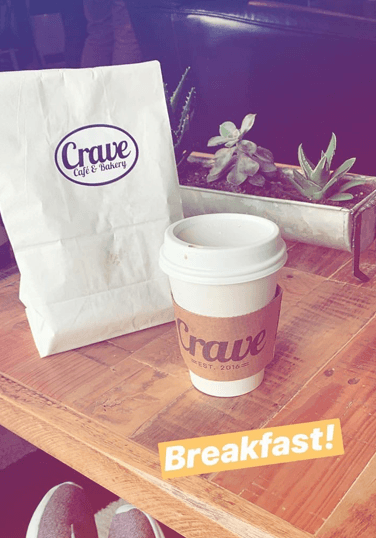 A quick jaunt no matter how you get there, but one thing is for sure – Crave is so good you’ll be trying to find ways to go back the next morning. Almost everything at Crave is gluten-free. You are going to want to sample it all, so pace yourself! There are gluten-free scones, gluten-free macarons, gluten-free cupcakes with flavors like Nutella, lemon raspberry, maple bacon, peanut butter chocolate and tons more. They also offer hot and cold teas, coffees, and various hot chocolates with homemade marshmallows. And let’s not forget their breakfast sandwiches (get the North Shore, it’s my favorite!) served warm on their homemade herb-cheese bread. This sandwich doesn’t have regular bacon, but maple candied bacon. Yum! 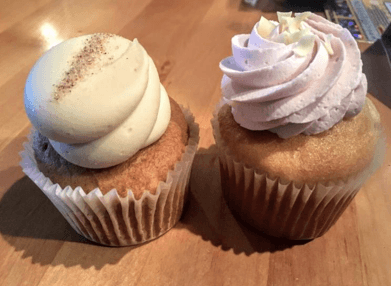 Crave cupcakes are so fantastic that my husband, who does not have any dietary restrictions, specifically requested them for his last birthday. I always bake a cake every year, but this was the first time he specifically requested something different. He told me, “All I want for my birthday this year are Crave cupcakes and nothing else.” I didn’t argue! Once you’ve sufficiently stuffed your face at Crave and have made your plans to return for breakfast the next day, you’re ready for a day exploring Salem. Back on Washington Street, begin at the Bewitched Statue, on the corner of Washington & Essex Streets. You can snap a photo of Elizabeth Montgomery as your first introduction to the witch city. Here you’ll be centrally located to shops, stores, restaurants, and bars. Everything is walkable and without large distances. Salem’s downtown is small and easily managed on foot. 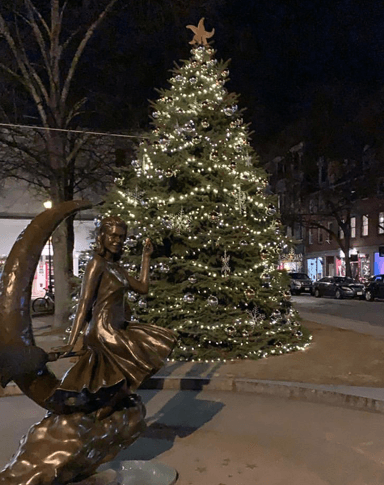 For souvenirs, book shops, fortune tellers, and both the Farmer’s Market & Flea Market (In summer and fall), walk the cobblestone streets of Essex Street east of the Bewitched Statue. It leads to more restaurants and cute shops as well as the previously mentioned Peabody Essex Museum. Check out Oak & Moss for decorative items, Roost & Co. for stationary, and Artist’s Row for crafts and creations of local artisans. There’s a ceramic shop, wood turning shop, and hat shop all within close proximity to one another. You can also view the Old Town Meeting House, which was used for the town dance at the end of the movie Hocus Pocus. After perusing the shops and maybe having your fortune told, you might be hungry for lunch. You have your choice of gluten-free options. Off Artist’s Row, The Lobster Shanty has excellent seafood, and The Adriatic offers a mix of Italian and Greek dishes, like their mouthwatering pasta bolognese and Caesar salad. Back on the cobblestone walkway, Village Tavern offers typical American pub fair, such as burgers and sandwiches. If you take Essex Street all the way to the east end, you’ll wind up at the Salem Common, an open green space with walkways, a playground and benches. The Common is often the location for outdoor summer concerts, carnivals (during Haunted Happenings), and anyone looking to enjoy a local public park. Directly across the street from the Salem Common is the Witch Museum. If you are truly passionate about witches and the history of witchcraft in Salem, it’s worth the small entrance fee to attend. Go at night for some ambiance! Down to the right on Congress Street & then a left on Derby Street will take you toward the waterfront and the Salem Wharf. There’s a lighthouse you can walk to where you can see the ocean and all the boats docked in the harbor (unless it’s winter!) On a sunny day many dog owners take this walk with their four legged pals. 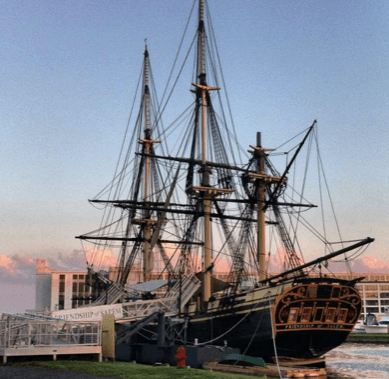 You can also find The Friendship of Salem, a replica of an East Indian Trading Vessel, docked at the wharf which you can board and explore. If you need a pick me up after your walk on the wharf, Jaho Coffee on Derby Street is the perfect stop for a latte or cup of tea. From here, continue further east along the peninsula to the birthplace of Nathaniel Hawthorne and the House of Seven Gables. Admission for both homes teaches you about the life of this author who helped popularize the city of Salem. Even further east is the Salem Willows Park on Memorial Drive. They have old fashioned arcades, a space for outdoor concerts, plus barbecues and a nice spot for a picnic or a walk by the water! Heading back west on Derby Street toward Washington Street, stop at the Old Burying Point Cemetery on Liberty Street. You can view where some famous Salem citizens have been buried, including a Mayflower pilgrim! Two blocks further on Lafayette Street is the Cheese Shop of Salem. They carry imported goods, various cheeses and wine. On Fridays they do wine tastings at a reasonable price and at anytime you can sample whatever cheese you like, for free! They also stock gluten-free crackers and mead, which is a honey-based liquor. If you are still up for more walking, head down to Far From The Tree on Jefferson Avenue and Jackson Street. While a little removed from downtown proper (it’s about a half mile from The Salem Cheese Shop) this cidery makes hard cider all gluten-free with the most amazing combinations and seasonal specials. Try the Cord if you prefer a dry cider; or Lei if you are brave (it’s pineapple and jalapeño! ), or for a happy medium, Apple or my Chai, which is sweet and tastes like chai tea and apple juice. They make all their ciders using local ingredients and you can see their fresh herbs growing on the patio. The bartenders are friendly and they have picnic tables; board games, corn hole, and more. Heading north toward downtown, take a left on Essex Street this time to view some of the most beautiful Georgian homes in Salem. The houses on this street are my absolute favorite, especially The Ropes Mansion, which you may recognize as Alison’s house from the movie Hocus Pocus. 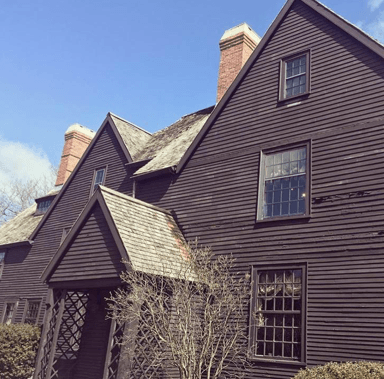 Adjacent to Alison’s House is the Salem Witch House where you can learn more about Salem’s history with witchcraft – the home belonged to a former judge of the witch trials. If you are hungry for dinner, you can find lots of options on Washington Street. Ledger has great cocktails and appetizers. For some awesome sci-fi memorabilia as well as gluten-free garlic knots, pizzas, and more, try Flying Saucer. Opus has delicious burgers with garlic aioli served on gluten-free bread, and Turner’s has some of the best seafood on the North Shore. To finish your day, you may be looking for something sweet and Melt is just the place. Dedicated to being allergen friendly, they have fantastic gluten-free ice cream flavors (like maple banana walnut) and gluten-free brownies. They go to extra lengths to clean off ice cream scoops and use fresh tubs of ice cream, plus the workers always give their hands an extra wash before serving someone with an allergy. While these details may be small, they make a huge difference and provide those of us on a gluten-free diet with peace of mind. If you are still down for more fun, head over to Bit Bar on St. Peter Street just around the corner from Melt. This throwback pub is packed with pinball machines and old school arcade games you can play for just quarters each. Their menu is full of weird and cool items, of which, many are gluten-free! Try the pulled pork! Or just check their menu- everything is clearly labeled. 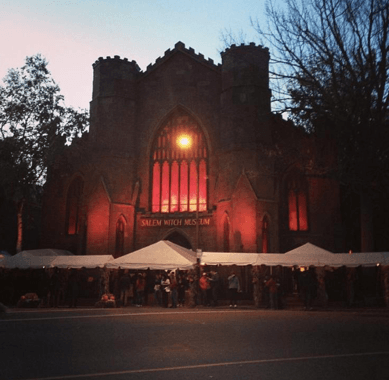 If you are a night owl who is interested in hearing a ghost story or two about Salem, sign up for an evening ghost tour. Led by a local guide usually in traditional Puritan dress, you’ll be guaranteed to finish your evening with a few laughs and maybe a few screams. Salem is filled with funky yet relaxed people, unique and traditional places, and a hip vibe that’s only encouraged by the local college of Salem State. There’s always a band playing, a pop-up, food truck, or festival to attend. 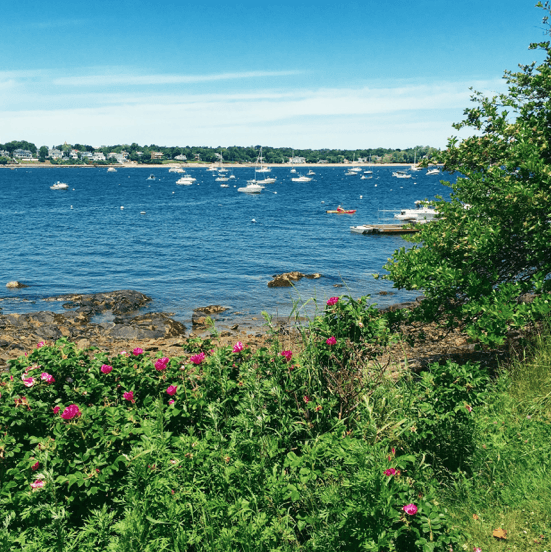 It’s vibrant atmosphere combined with the quaint waterfront views gives Salem an advantage over other seaside towns. 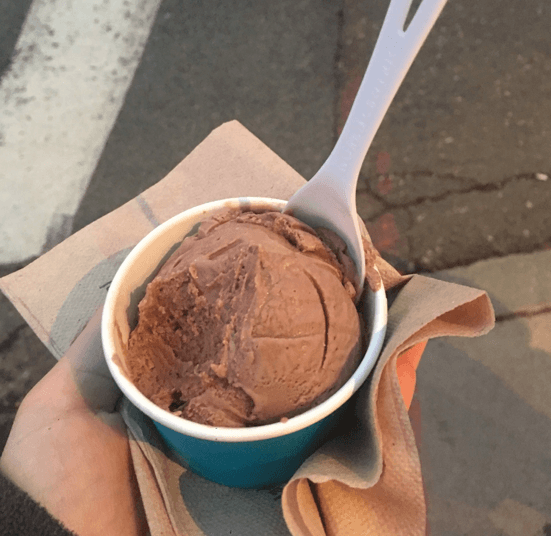 With the amount of new restaurants opening left and right, there’s usually another gluten-free treat just waiting to be sampled. Jennifer Fitzpatrick was diagnosed with celiac disease in 2009. She is currently dreaming of Crave cupcakes as she and her husband travel the world for the next five months. Follow her gluten-free adventures on Instagram @jefinner589 or @thenomadicfitzies724 or on her website www.thenomadicfitzpatricks.com. Fitzpatrick’s series on Gluten-Free New England will be shared at Gluten-Free Living for the next five months. Check out her guide to Boston here.